The KIDZ PHOENIX™ is the most supportive and functional chair of the Seating Matters chairs and is available in both adult and children’s sizes. The KIDZ PHOENIX™ chair provides pressure distribution due to the multi-stretch material and reflex foam in the seat cushion and offers a great deal of support with the tilt in space mechanism and adjustable supports. In addition, the KIDZ PHOENIX™ head support accommodates those with kyphotic postures, hyperextension, or those who require upper body and head support. The angle of the back can be adjusted to accommodate the patient and the elevating legrest can be raised and lowered, also increasing patient comfort. The tilt in space will allow all angles on the chair to remain the same while tilting the patient back, allowing their weight to be spread throughout the body and reduce pressure on a given point. The push handle and castors allow the patient to be transported in the chair. It is fully hoist accessible which reduces moving and handling significantly. The removable arms facilitate width adjustment and also side transfers. The KIDZ PHOENIX™ arm height, seat depth and width as well as the footplate height and angle are all fully adjustable. REAL PATIENT CASE STUDY Bear suffers from complex epilepsy. Before Bear got his Kidz Phoenix, he sat in unsafe chairs that would increase his risk of falling from the chair. Doctors told Bear’s family that he wasn’t going to live beyond 10 years old and now at 13, he much safer and happier in his Seating Matters Kidz Phoenix chair. 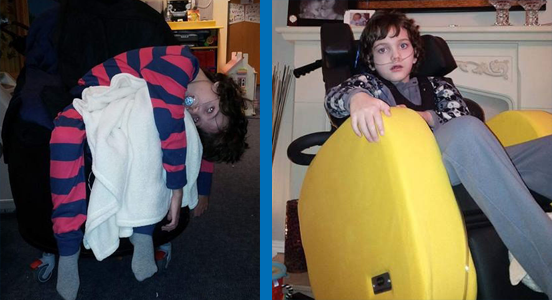 Bear’s Mum, Alison says “I do believe that his chair has helped prolong his life and for that I am truly overjoyed”. Back recline and elevating leg rest. Unique adjustable back and head support. Fully adjustable in under 1 minute, without tools. Forward tilt for stand transfers. For more in-depth information on all the KIDZ PHOENIX™’s features, dimensions and specifications, please feel free to download the operational manual. The Seating Matters Kidz Range provides postural support and comfort while facilitating function or activity. Discover more by ordering your free copy of our Kidz Product Guide.